What is Telemedicine & What’s With All the Buzz? Telemedicine which includes audio and video conferencing, remote monitoring of vital signs, nurse advice lines, and transmission of images and test results, is a subset of telehealth. 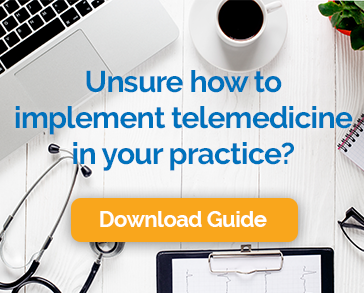 While telemedicine is limited to clinical purposes, telehealth also includes non-clinical encounters like medical education, provider training, and administrative meetings. You may notice, however, that the terms telemedicine and telehealth are often used interchangeably. Store-and-forward: Store-and-forward technology lets providers share patient medical data with each other. It’s a bit like email, but with advanced privacy and security features. Remote patient monitoring: With remote patient monitoring (also called telemonitoring or home telehealth) providers can keep track of a patient’s vital signs and other health data at a distance. Real-time telemedicine: Real-time video visits conducted on a telemedicine technology platform provide an alternative to in-office care. Patients and providers simply log in to an online application and chat using high definition video conferencing. Why All the Attention to Telemedicine Now? As we mentioned, telemedicine has been in use for a long time, so why is everyone talking about it so much now? One reason is that the growth of the internet and the ubiquity of devices with video capabilities have made telemedicine accessible to a large portion of the public. The other is that increasing strain on our healthcare system demands a more efficient, cost-effective way of delivering care. Providers, insurance companies, and even state legislatures have taken note of the public’s willingness to embrace telemedicine as an alternative to traditional in-office visits. In fact, most states have now passed laws requiring that insurers reimburse providers for video visits. Even when they are not required to do so, private payers realize that telehealth is a great way to keep the cost of care down, while still ensuring that patients get great health outcomes. Telemedicine is emerging as an important channel for healthcare delivery. Providers can earn more, enjoy more flexibility, and expand their markets. At the same time, patients save time and the hassle of missing work or making child care arrangements. That’s why most people see the increasing use of telemedicine as a huge step forward.